Still feeling the waves of Nintendo's big risk on the winds of change. While Super Smash Bros., Super Mario Sunshine and Metroid Prime established GameCube as another trail-blazing Nintendo console worldwide, The Wind Waker made it essential to own. Fifteen years after its release in the west, director Eiji Aonuma’s masterpiece still shines. Back in 2003 Microsoft and Sony were pushing the appeal of visual realism hard, attracting mature, ‘cooler’, audiences, and very much seeming to be the way forward in videogames. It was considered to be a bad time for Nintendo to debut a cute and ‘cartoony’ appearance for one of its flagship series. Not everybody despised how The Wind Waker was presented, but there was enough negativity from critics to detract from the splash it deserved to make. During interviews at the time, Aonuma explained that he wanted to make a visual departure from the perceived ‘realism’ of the Nintendo 64 games Ocarina of Time and Majora’s Mask, since the larger models harmed the playability. By making Link appear child-like, this made him easier to manoeuvre and allowed him to travel faster across distances. It followed that a more colorful, cel-shaded style could suit this world that felt closer to A Link to the Past. 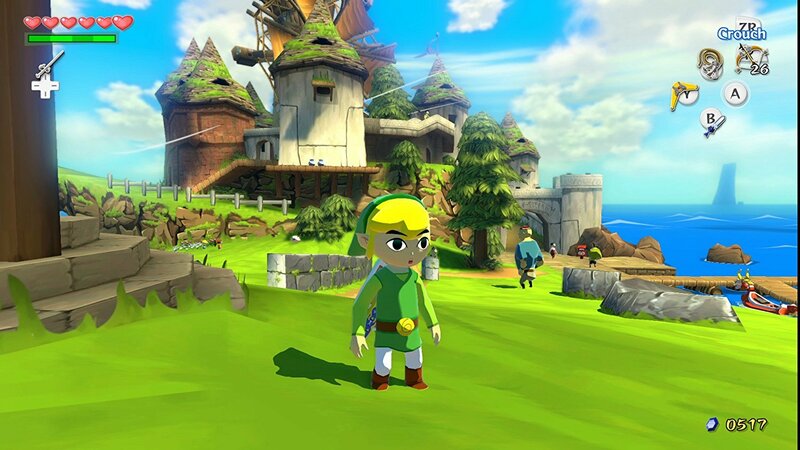 In the days before YouTube began revealing most of what we needed to know about visual presentation in action, actually seeing The Wind Waker in action was enough to appease fans who had been worried that a favorite series had taken a step back. The animation was sublime, like an anime sprung to life without the hard-edged ugliness of e.g. Jet Set Radio on Dreamcast. Upon reaching the end of the story, anyone who played Wind Waker fell in love. Another beautiful insight from Aonuma in 2003 is that he had recently become a father, and was starting to see the world anew through the eyes of his son, just over a year old. Familiar places held fresh secrets. Sometimes Aonuma’s son reacted to things that were not visible, which could be scary. The director wanted players to feel immersed in Link’s magical world, forming a relationship with characters around them. Aonuma didn’t want players to make progress alone, which explains the communication between Link and his boat, the King of Red Lions, and Tetra of course – who is later (SPOILERS!) uncovered as a descendant of Princess Zelda. 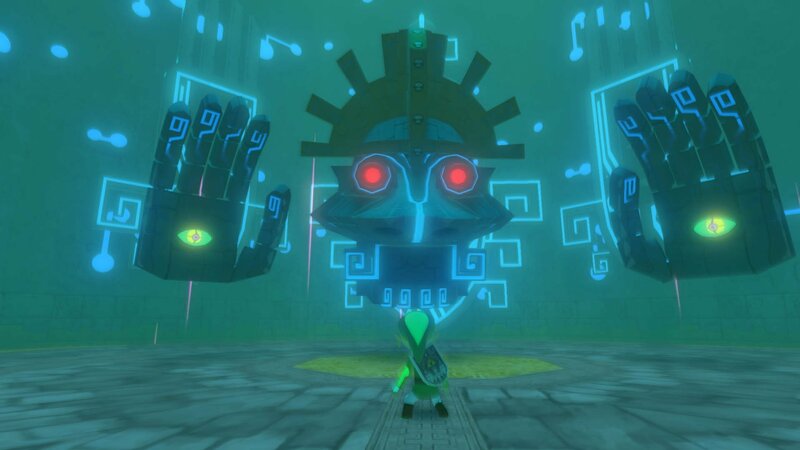 Every puzzle within The Wind Waker is intended to be solved within the game world, which is preferable to guidance from friends and online FAQs. The steps that Link follows all seem logical, leading to players enjoying that Eureka! moment, feeling clever for having found the solution themselves. A puzzle may seem troublesome, but answers are always within reach. 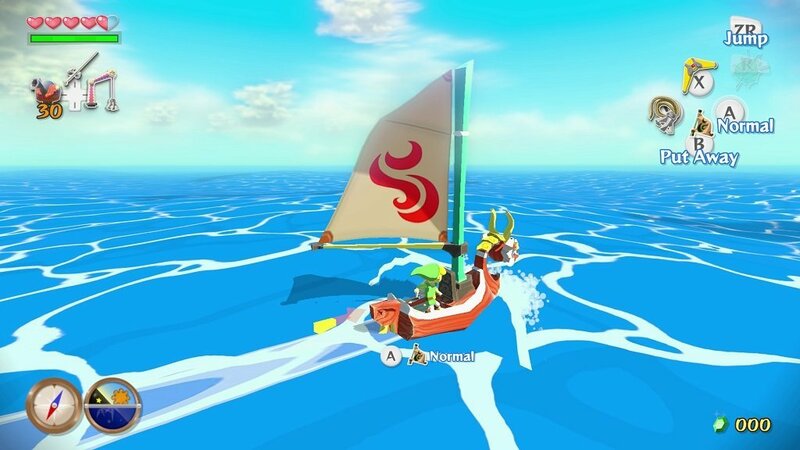 Unfortunately there is one, far-reaching, wholly unavoidable failing within The Wind Waker, which is the sailing that is central to the adventure. The basic mechanics are enjoyable, and there are plenty of sea-faring activities, such as the hunt for sunken treasure. Distances are huge, however, and unlike the plains of Hyrule, The Great Sea is largely featureless, making journeys to and fro the various islands extraordinarily tedious. This problem was addressed in the HD remaster for Wii U (2013), but even with a Swift Sail exploration can be tiresome. Thankfully, all other aspects of Wind Waker are rock solid, in particular combat which is exhilarating owing to its precision and wide range of moves. Sneaking past the guards can be thrilling too; a stealth option called upon to navigate some dungeon areas, bringing foes to life in subtle ways meaningful to the gameplay. Success in combat very much relies on reading an opponent’s intentions, figuring out their weaknesses, before choosing whether to strike or defend, or find some other means – such as deflection – to take them down. This added depth to the combat is owing in no small part to the wonderful animation of enemies great and small. The whole world just feels alive. As the game progresses, Link acquires cannons for the King of Red Lions to battle rival ships, Big Octos, and destroy fortresses out on the ocean. This almost makes up for all that sailing. As we mentioned earlier, no matter how defensive you may have felt at the outset of Wind Waker, after encountering its many personalities, friend or foe, it found a way to your heart. The organic little Koroks of the Forbidden Woods are beguiling. Tetra becomes a fearsome and selfless ally, that you later look back on the whole journey to appreciate even more, her secret identity revealed in a moment of unparalleled, hair-raising drama for the series. 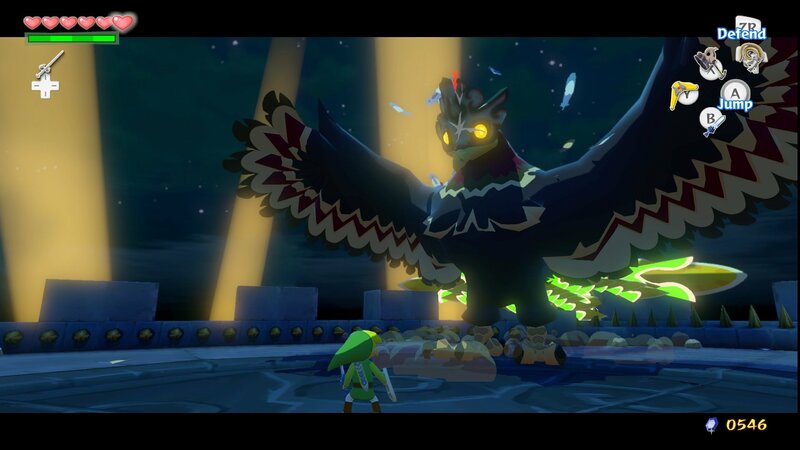 Wind Waker boasts some of coolest boss encounters in The Legend of Zelda saga, the arrival of Gohma early on is monumental; the fluttering wings of the Helmaroc King atop Forsaken Fortress are astounding to behold. The hectic Jalhalla encounter is a David meets Goliath moment with a hint of WWE hilarity. Gohdan, The Great Arbiter, feels doubly intimidating owing to the initial unpredictability of disembodied arms amid an otherworldly chamber. 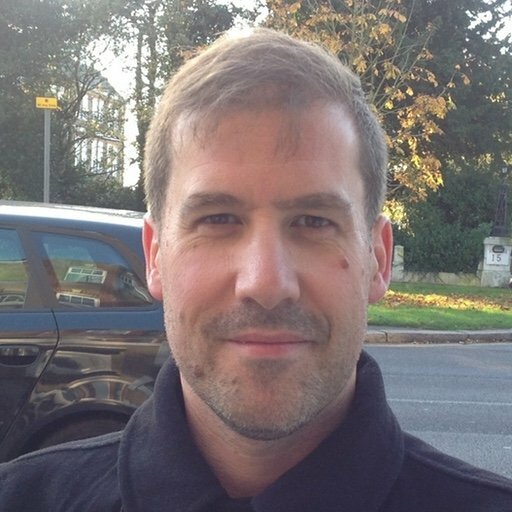 We remember our jaws hanging upon first sighting of Forbidden Woods boss Kalle Demos. The Legend of Zelda: The Wind Waker is arguably the most characterful of all the games in the series, and for some fans it has become the favourite of them all. It’s certainly not to be missed by anyone in possession of a GameCube, or Wii U. Curiously, we are still waiting for an updated version to appear on Switch, something that we are all begging for by now. In the meantime, a pre-owned Wii U with the 2013 HD remake is the best option to consider.